What’s happened to the Sands End Community Centre since the infamous Cabinet Meeting on 7th February when H&F Conservatives agreed to close it down and sell it off? Regular readers will recall that the Borough's cabinet were visibly shaken by the hundreds of people that turned up to plead for a different ‘big society’ solution that could save the centre. So in front of the largest crowd I’ve ever seen at a cabinet meeting the Conservatives muttered a reluctant promise to work with residents to consider all options to keep the centre open. Well, the latest news is that many of the services will cease to operate from the end of April. In fact there has been no contact from the Conservative Administration or from Sands End’s three Conservative ward councillors. Rosie Borgia, is one of the residents that’s been working to save the centre. 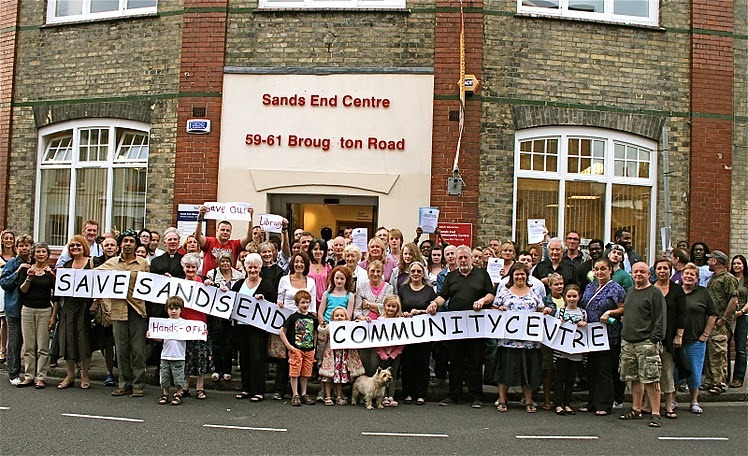 She tells me "The Council is already actively shutting down the Sands End Centre: they are withdrawing services one by one and we will be left with nothing but an empty shell which will be a disaster for this community. The latest I'm told is the gym will cease to operate from end April despite no provision for hard up locals. The Council now simply points to the cheapest private gym which offers a discount rate only if you sign up to a 12-month direct debit and it doesn't accept Lifestyle Card or offer pay-as-you-go, making it impossible for most of the pensioners and those on low incomes who use the Sands End community gym to go there"
Why wouldn’t H&F Conservatives do that?.. After all, the Sands End volunteers are the epitome of the one pre-election idea David Cameron presented to the nation. But there’s not been a single positive squeak from the Conservatives in Hammersmith Town Hall. Maybe the Sands End campaigners should go over their heads - direct to Number 10. If Mr. Cameron is serious about the ‘big society’ his team should at least want to hear about the impressive approach these local residents have taken to maintaining these important services in a very mixed area in south Fulham.